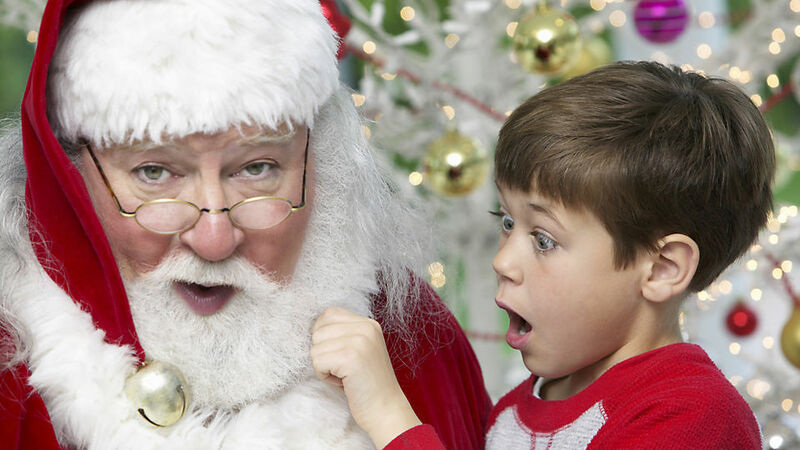 Having the Santa talk with your kids would be a major milestone and rite of passage – pleasant or unpleasant. I have been facing this question since my child turned 6, about two years ago – Is Santa real? Well, Santa talk – here we go! Call it media exposure, call it peer pressure, or simply call it growing pains – but children end up seeing through us sooner than later. That sooner has become much sooner for the generation we are rearing, with iPads on their laps, and the remote on the side. Indulging in the letter writing, cookie serving wait for Santa on Christmas Eve is now a wistful thing for me because I now know that my daughter probably goes to sleep that night, her mind restless with the thought that Mommy is Santa. No more excitement or tossing and turning to catch a glimpse of that Ho ho ho-ing jelly belly with a beard as white as snow. No more innocent squeals that someone she has not even met knew how much she wanted roller blades. All that is now just background noise as her mind tries to process a grown up matter that is still beyond her young years. Is it time for the Santa talk? Unfortunately, yes. Is it a good sign though? Not. So here is Plan A. I am going to put off the Santa talk and declare it as an off limits subject. For now. I am going to squeeze my eyes tightly shut and fix every argument about Santa with eeny meeny miny mo. I am going to be downright juvenile and tell her that her best friend does not know a thing when she said she saw her mommy placing those gifts in the stocking. And of course, since none of this is really going to happen, I will have to go with Plan B. The Santa Talk. If nothing else, that bought me some time. I now have to listen to a million theories that she tries to come up with, in order to justify the existence or non existence of Santa. The older she gets, the more glaring it will become – especially when she sees a different Santa at every store and actually registers this small fact. Therefore, I have decided that the best way to have the Santa talk is with full honesty. It would be a great idea to start talking about the story behind Santa and what it really signifies so that the Santa talk does not come like a blow. Enlist your near and dear ones to echo what you are saying. I know for a fact that my friends and I are sticking to the same story when asked if Santa is real – “Yes, Santa is real. He is the spirit of Christmas. More on that later – in a few years maybe. Or maybe you will figure it out on your own.” The spirit assumption came from an exceptionally bright boy of 7 who was trying to soothe his best friend (my daughter in her ‘is Santa real’ moment, as the helpless mommies stood by). God bless this boy! The mommies of friends who play together, need to stay together. Simple law of nature. As your children grow older, the Santa talk will veer towards questions about why you supposedly “lied” to them for so many years. The best policy here would be honesty, again. You would do well to explain how the excitement of the holidays is difficult for young children to understand and how it was easier to explain the gift of Christmas with actual gifts from a character who signifies all the wonderful things about this festival. It will take a little bit of cajoling and maybe a treat or two, but talking about it in a grown up, confessional way will help your child feel in cahoots with you. This will also build better understanding and the child will actually listen from your position. For things larger than Santa, too. So are you ready to have the Santa talk yet? More than anything else, you will need to remember that this is a part of the wonderful world of parenting and this small instance will be well behind you when you strive to give them larger life skills and life lessons. Yet, in their small world, every little thing is big. Do not forget that when you have the Santa talk. Do not be dismissive of their doubts, and do not simply tell them to be grown up about it. Teach them to question, find answers and move on, instead. That is how you will win their trust – that is how they will know how much they matter to you.